"Romeo has been really sweet to Juliet, following her around the aquarium and sacrificing his worm meals for her." 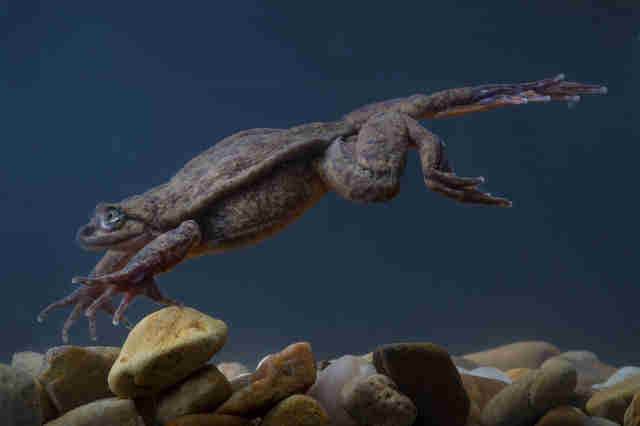 Not long ago, a frog named Romeo was thought to be the last of his kind on the planet. 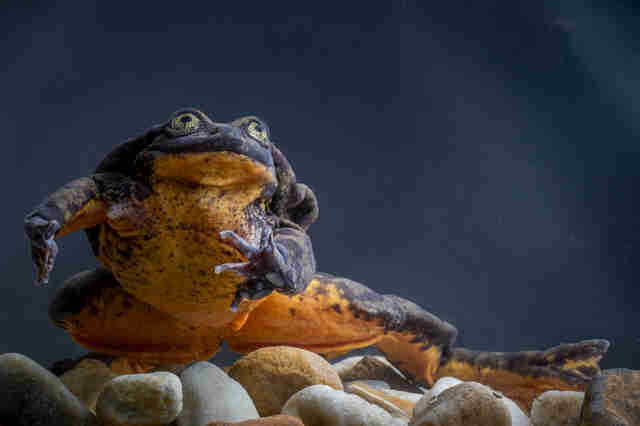 Earlier this year, though, fate smiled on lonely Romeo, the Sehuencas water frog — and some scientists had a hand in helping him out, too. Researchers found a mate for Romeo in the forests of Bolivia and they played matchmaker for the couple. 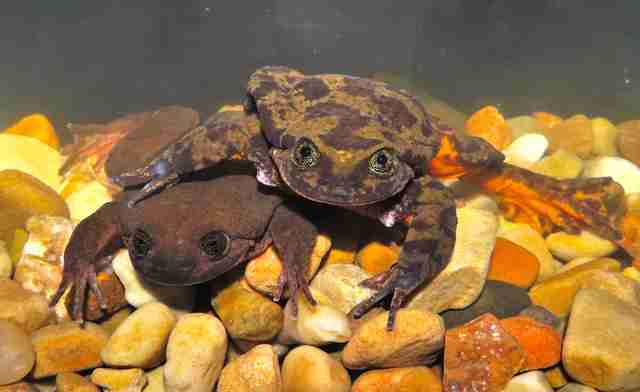 "The first date between Romeo, once the last-known Sehuencas water frog, and Juliet ... went so well that the two have been living together in Romeo’s aquarium since," Global Wildlife Conservation (GWC) told The Dodo in a statement. The pebble-lined aquarium where Romeo had been living has transformed into a veritable love nest. "Romeo had stopped calling [making a kind of singing sound] at the end of 2017, but started to call again March 1, right after he and Juliet were placed together in the aquarium he’s been living in," GWC wrote. "They have been together there since." The aim isn't just true love — the future of this type of frog could depend on Romeo and Juliet's courtship going smoothly. If all goes well, there will soon be a tadpole nursery, where Romeo and Juliet's offspring can grow up, with the aim of returning the frogs to the forest, helping to increase the wild population. While waiting to see if Romeo and Juliet successfully have a family, people are also getting to observe these rare animals and learn more about them. Not only has Romeo started singing again, he's also started to dance. 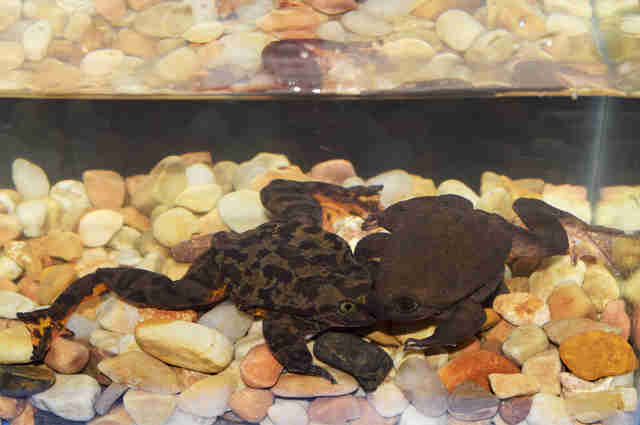 "Since meeting Juliet, he’s also exhibited what water frogs experts are saying is a behavior they have never [seen] before," GWC wrote, "rapidly moving the toes on his back feet when he’s near Juliet, likely a species-specific performance meant to impress the female." Whatever ends up happening between the couple, it's clear that, at the very least, they're both more starry-eyed than star-crossed. Matchmaking like Romeo and Juliet's have helped other animals come back from the brink of extinction — you can wish the couple good luck by making a donation to GWC.